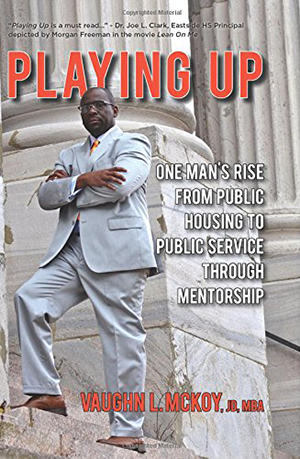 In his honest and revealing biography, former Rutgers University football standout and Assistant United States Attorney Vaughn L. McKoy leads readers through the mind-set and strategies he adopted that result in personal and professional success. An inner-city youth from Paterson “P-town” New Jersey, Vaughn becomes convinced life has more to offer than drugs, gangs, and prison. Throughout grade school and high school, despite the lure of the streets and the shock and responsibility of becoming a teenage dad, he strives for athletic excellence, encouraged by baseball, basketball, and football coaches whose teachings are never solely about the game. After being awarded a football scholarship to Rutgers University, Vaughn meets alumnus, attorney, and business mogul Arthur M. Goldberg while lifting weights. For the next ten years, “Mr. G.” weekly mentors Vaughn to pursue academic and professional success. Under the mentorship of Mr. G., Vaughn continues his rise to professional achievement as a law firm litigator, an Assistant United States Attorney for the District of New Jersey, and the head of the Criminal Division for the New Jersey Attorney General. Today, Vaughn is a corporate lawyer and executive at Public Service Enterprise Group, Inc. Inspired by Mr. G. and others, Vaughn embarks on a personal mission to “give back” and help organizations and people achieve their goals. Chapter by chapter, through Vaughn’s trials and triumphs, Playing Up builds in readers the mind-set of ongoing achievement and the inspiration to obtain the guidance of a mentor and meaningful relationships. Playing Up is more than a biography. It’s a true-to-life compass its readers can follow to play up in their own lives, one that can lead them to engage in mentoring relationships that provide ongoing direction, accountability, and encouragement, written from a mentee’s perspective.